We are trying to collect dilute energy across a million square kilometers with heavy machinery in extreme conditions. What could possibly go wrong? 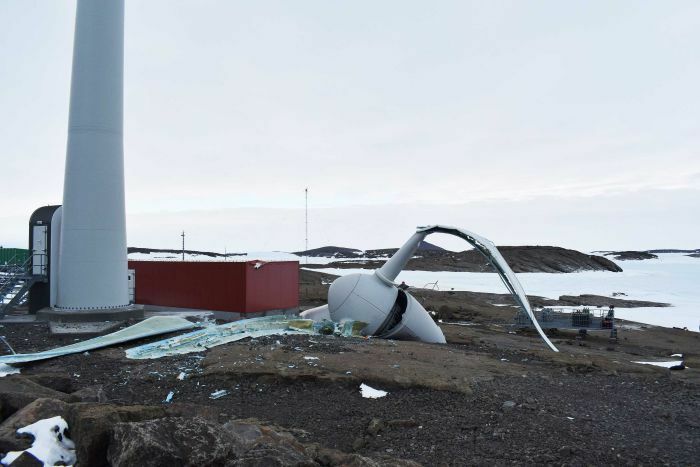 Last night around 9pm, the top part of the 30-metre turbine fell off in 40 knot winds — which is not unusual in Mawson (in September wind gusts of 185km/hr were recorded). Fortunately no one was killed because people were inside. Though it looks pretty close to that red building (was anyone there?) No one knows why it happened. The other turbine at the station has been turned off as a precaution (though I wouldn’t be walking underneath it). Maybe someone can tie ropes with a helicopter? Wind Turbine, Antarctic research station, Mawson, break, collapse. Right now things have warmed up a lot at Mawson, and temperatures even climb above 0C by 3pm some days. Though on November 1 the maximum temp was -8.8C. Naturally diesel saves the day. Of course Mawson is fully backed with diesel power. These are 300kW turbines installed in 2003, so only 14 years old. Maybe it was just bad luck. The maintenance costs of renewable energy are only just being figured out. Imagine the headlines if a 14 year old coal station suddenly dropped something from 30m up on a path that must weigh several tons, it would be “another reason” to give up fossil fuels. Average wind speeds for Mawson are about 10m per second according to Dare and Budd, 2001. That translates to 36km/hr. BoM Weather observations for Mawson show winds are about 65km/hr with gusts to 96km/hr in the last day or two. Business Insider is also covering this.